in an office and needing an exercise program you can do at your desk. with a group in a retirement village looking to maintain your active lifestyles. in a wheelchair and wanting to do something by yourself. recovering from an injury and wanting to increase your core stability and strength quickly. improved fitness from the comfort of you own chair. able to do the class in a group or by yourself. low impact exercise that you can do anywhere. In these classes you will learn gentle yoga postures, breathing techniques, meditation and relaxation methods, designed to develop physical fitness and clarity of mind. 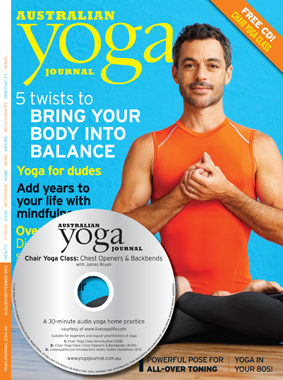 James Bryan is a yoga teacher with over 30 years experience and designed two Chair Yoga series for you to choose from. For Open / Beginner / Foundation Level – Check out Chair Yoga Series of Classes. Exercise from the comfort of your own chair with experienced Cairns-based yoga teacher James Bryan. No yoga experience required. Check out this new release – the complete set of 7 Chair Yoga Open Level Classes. These classes are designed to support you to maintain and enhance your fitness, and quality of life. The physical exercises (called yoga postures) together with the breath-work provide a holistic program supporting you to keep your body, mind and spirit active and healthy. These classes have been design for use by anyone in the comfort of their own home, or in a group with the assistance of a diversional therapist or suitable qualified health professional. Each class covers – centring, breath-work, yoga postures, guided-relaxation, and positive philosophy. They provide a well-rounded practice to stimulate your body, mind and spirit. Level 1 is designed for where you are solely in your chair. Level 2 are more active classes compared to level 1, and have been designed for use by anyone active and stable on their feet, and are specially useful if you need the support of a chair for some balance or support. Its really easy to start – all that you need is your chair. Level 1 Class 1 – Breath & Foundation: With this class you will experience a complete practice that exercises your body and stimulates your mind. The intention is for you to feel energised, centred, calm and relaxed. It focuses on stretching your arms and sides, and increasing mobility through twists. Level 1 Class 2 – Hamstrings & Core Stability: Building on from Class 1, this class further exercises your body and stimulates your mind. It focuses on gently stretching your arms, sides and back, increasing mobility through twists, and increasing your core stability. The intention is for you to feel energised, centred, calm and relaxed. Level 1 Class 3 – Lateral Stretches & Twists: This class further explores increasing mobility in your arms, and side, and works to stretch your legs, and further develop your core stability. You will exercise your body while stimulating your mind. By the end of the class, you will feel energised, calm and relaxed. Level 2 Class 1 – Balance & Standing Postures: This class builds on the concepts & principles from Level 1, James takes you one step up into this active set of Level 2 classes. In Class 1, you are introduced to standing postures that work on your balance and grounding. Explore traditional postures like Triangle Pose, Plank Pose, and Downward-Facing Dog, among many others, using a chair for both support and to take you deeper into the pose. Level 2 Class 2 – Chest-Openers & Back Bends: Building on the foundation from Level 2 Class 1, James guides you through postures that work on releasing the shoulders, opening the chest, and releasing tension and strengthening the lower and upper back. Once again, these focus points are high-lights to a complete and whole-body exercise. Level 2 Class 3 – Grounding & Leg Stretches: Here James Bryan builds the foundation work from Classes 1 & 2, exploring deeper hip, groin, and hamstring stretches. This holistic class gives you a complete body-mind-soul routine, with James’s consistent emphasis on breath-work, and positive philosophy to assist you in taking yoga off the mat! Level 2 Class 4 – Core Stability & Twists: This is an energetic class which integrates the balancing and grounding work established in the previous classes, and which focuses on deeper abdominal work, twists, and back bends. A good class for integrating the philosophy, breath-work, strength & stability cultivated through these series of Chair Yoga Level 2 classes. For Open / Beginner / Foundation Level – Check out Chair Yoga Complete Set (Classes 1 to 7). Exercise from the comfort of your own chair with experienced Cairns-based yoga teacher James Bryan. No yoga experience required.